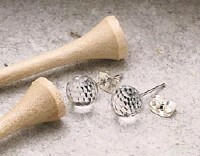 for the discriminating woman golfer. 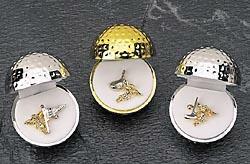 Two-tone golf guardian angel tac pins cleverly packaged in a hinged gold or silver golf ball. Combination gold- and silver-plating. Dozen assortment includes three different styles. DESCRIPTION Look no further than your ears to find your ball marker! 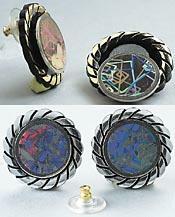 Thin, iridescent magnetic ball markers attach directly to earrings. That's convenient! Available in gold or silver (pierced only) please specify. DESCRIPTION Two-tone bezel with sporty golf ball face and sweep second hand. Golf club minute hand provides the perfect "follow-through." Stainless steel back and croc-embossed leather strap. 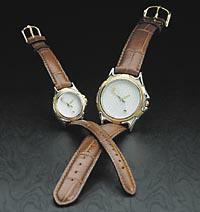 Accurate quartz movement one-year limited warranty. Please specify men's (1-1/2" dia. face, 1/2" band) or ladies" (1" face dia., 1/2" band). Each is gift-boxed. Dimpled and faceted to catch every glimpse of light. A brilliant pair. Swarovski crystal. Minimum order $100. Orders under $100 incur a $5 surcharge fee. Terms: Net Cash or PayPal. No return of merchandise will be accepted without an authorization number.